To legalize it or not? The national debate continues over marijuana and hemp-derived products. There’s lots of buzz in the news right now about the potential health benefits of taking CBD oil. Cancer patients, arthritis suffers, epileptics, chronic pain sufferers… all tell stories of near-miraculous improvements in their conditions since beginning CBD supplementation. Is CBD legal? Does it make you high like marijuana? And … do the potential health benefits extend to dogs, too? To understand, first let’s talk about what causes the “high” … and the KEY DIFFERENCE between marijuana and hemp (everyone gets this confused) … and how these differences impact law makers decisions about what’s “legal” and what’s not. The cannabis plant is a special species that contains as many as 400 different cannabinoids, which are substances that affect the functioning of your immune system. THC links to CB1 receptors in the brain and controls your mental state (why it’s associated with the “high” of pot). That’s why THC is renowned for producing a mental “high” while CBD is linked with improved immune response and healing. Research about how, exactly CBD works is still being done, but evidence shows it has impressive potential for reducing pain and inflammation. [iv] Plus, it stimulates an immune system response… turning healing on, and turning pain off … as opposed to just masking pain like other medications. But is it legal to give CBD to your dog? Like with humans, that depends on where your CBD comes from and where you live. Understanding the details begins with knowing the difference between hemp and marijuana. Hemp Verse Marijuana: What’s the Difference? Though the terms are often used interchangeably, hemp and marijuana are NOT the same. Instead, both plants share a common ancestor: cannabis sativa. Generations of selective breeding have split them into separate species, and they both contain varying amounts of cannabinoids. The amount of each substance within the plant depends on whether the strain grown was classified as hemp or marijuana. Hemp is a tall, fibrous plant that is frequently used to make paper, rope, textiles and a variety of industrial products. The seeds are also valued as a food source, and they are processed into cosmetics, lubricants, and paints. Since hemp is bred for its tensile strength (not cannabinoid content), it tends to have low levels of THC. In fact, the plant must legally contain less than 0.3 percent THC to be classified as hemp. These low levels mean that hemp is legal to import, ship, and sell across the United States. And this makes industrial hemp the preferred source of CBD oil. Marijuana, in contrast, is a shorter, bushier plant that’s cultivated with cannabinoid levels in mind. So while you CAN extract CBD from marijuana plants, the THC content is significantly higher. And this means that in most states, it’s ILLEGAL to sell (or buy) CBD derived from marijuana. Understanding what’s legal and what’s not when it comes to CBD, marijuana, and THC can be tricky. Legislation continues to evolve, and it’s different from state to state. Your best choice, to be certain you’re abiding by the law while still getting the highest quality product, is to purchase CBD Oil that’s derived from organically grown, industrial hemp. It will contain less than the 0.3% THC required by law, and as a dietary supplement sourced from hemp, will be legal to purchase across the country. The same holds true, whether you’re buying CBD oil for your dog … or for yourself. What Do Vets Think About CBD Oil? Vet opinions vary on the use of CBD oil. So even though CBD oil from industrial hemp is LEGAL across the entire country, some vets still won’t recommend it. Likewise, your vet’s ability to recommend or prescribe a CBD product changes based on state lines. In California at the time of writing, people can buy marijuana-derived CBD for recreation, but vets can’t legally recommend giving it to dogs because it has “Schedule 1” classification from the federal government. This creates a strange dynamic for pet owners. You can buy CBD oil at your local pet store in some states, but your vet can’t “prescribe” it. Assuming you’ve sourced CBD Oil that’s derived from organic industrial hemp, the next step is getting your dog to take it. So how do you make it easy? The #1 recommended method is via a dropper. Either straight into your dog’s mouth, or put a few drops on his/her food. Some folks like to bake the CBD oil into homemade dog treats. But doing this, you risk destroying the beneficial cannabinoids with the heat. It’s better to simply add tincture drops to your dog’s meal, or hide a few drops in treats. Plus, you have better control over the dosing when you administer it, one serving at a time. By giving your dog CBD oil with a dropper, you make sure it’s absorbed into their bloodstream quickly, for best results. 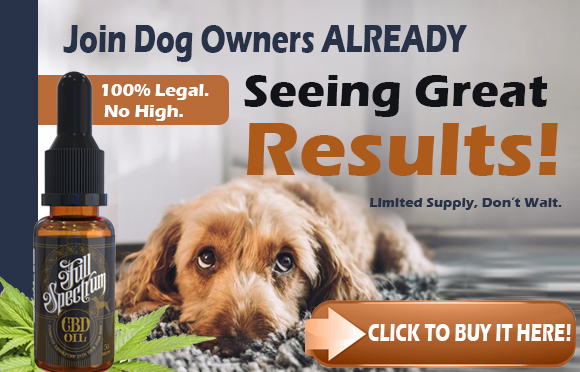 For best results, you obviously want to give your dog the correct dose of CBD oil. Side effects aren’t common, but watch for lethargy, heavy drooling, or vomiting. And obviously discontinue use if your dog experiences any of these. 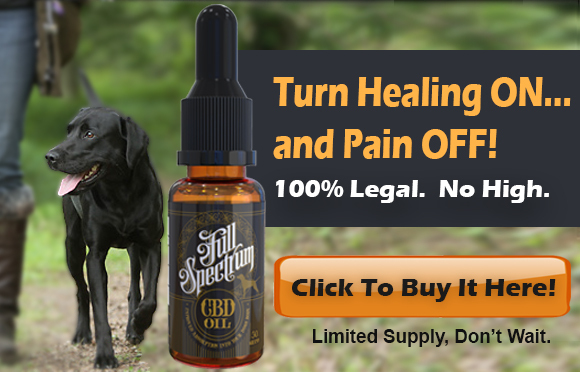 With all the buzz about the potential health benefits of CBD oil, you may decide to try giving it to YOUR dog. Especially if you’re got a canine buddy who suffers from arthritis, joint pain, chronic pain, skin conditions, epilepsy, digestive disorders, or a degenerative disease. Just remember… to make sure you’re buying CBD oil LEGALLY, you should be buying CBD oil derived from industrial hemp. It should also be, ideally, organically grown, free of pesticides and solvents. Avoid CBD oil derived from marijuana. It will contain high levels of THC, which produce a “high” your dog won’t enjoy. Plus, it’s currently illegal in most states. And be sure to follow the dosing guidelines laid out by the manufacturer. [vii] Hempmedspx: 50 States: Is CBD Oil Legal to Purchase? [x] Hempmedspx: 50 States: Is CBD Oil Legal to Purchase? [xiii] Herb: We asked a vet: what’s the deal with CBD for dogs?